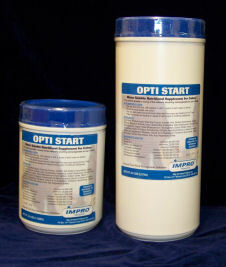 Opti Start is a soluble product which may be mixed with water, milk or milk replacer. Formulated for new born calves and calves needing a nutritional boost during times of stress. Feed 1 to 2 oz. of Opti Start per feeding as needed. Available in: 2.5 and 5.0 Lb canisters or 30 Lb pails for larger operations.